Seminarian Christopher Williams rings the bells for the special occasion. Stain glass window of Our Lady of the Rosary. Many items of the old church were incorporated to the Mass to commemorate 150 years of our history. The mesquite wood crucifix in the sanctuary, carved long ago by one of our priests. Father Ricardo Bauza is wearing a vestment from the old St. Genevieve Church. Father Juan Moreno is wearing a vestment from the old St. Genevieve Church. 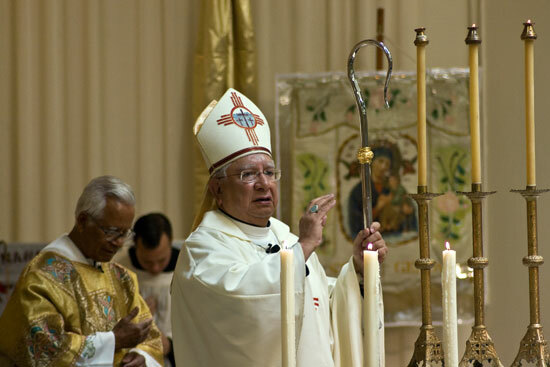 Father Juan Moreno concelebrating with Bishop Ramirez. Father Bauza with Bishop Ramirez at the end of the Eucharistic Prayer. Bishop Ramirez is sharing a few thoughts. Bishop Ricardo Ramirez at the old pulpit. Father Ricardo and Bishop Ricardo are blessing medals of St. Genevieve.